Andrew Zarian (CEO/Founder) – born and raised in Queens, New York. When Andrew was just twenty years old, he opened his first business, a retail store that he later sold to take on an IT job. He was laid off in May 2009, he then decided to pursue his true passion; creating and leading an internet broadcasting network. 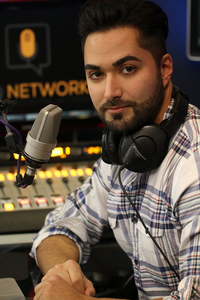 Andrew realized his dream with the creation of Guys From Queens (GFQ) network..
Now joined by over a dozen more people on the creative team who host and contribute to the various broadcasts on GFQ. Each show can be seen live on GFQlive.tv, and can be downloaded as an Audio/Video podcast from the GFQ Network website. The network has over 13 shows per week covering everything from news to pop-culture, technology, opinion, comedy, hairloss, and entertainment. In 2012, Andrew co-founded and launched the International Association of Internet Broadcasters (IAIB), a principal voluntary trade organization representing the interests of Internet broadcast professionals throughout the world. Considered the most prominent and effective voice of internet broadcasting, the IAIB was founded in direct response to the growing sentiment that this powerful broadcast medium was in need of appropriate representation. The International Association of Internet Broadcasters not only represents independent and corporate broadcasters, but welcomes equipment suppliers and providers of other services to the Internet Broadcasting Industry. The IAIB provides educational resources, representation, and networking opportunities to Internet broadcast professionals, and to all those interested in participating and learning more about this fastly emerging broadcast medium.